24 days until christmas. What? 24!? WHAT. Let that just sink in… Where has the year gone?! If you haven’t already started Christmas shopping and are feeling a bit frantic, don’t worry, I’ve got your back. 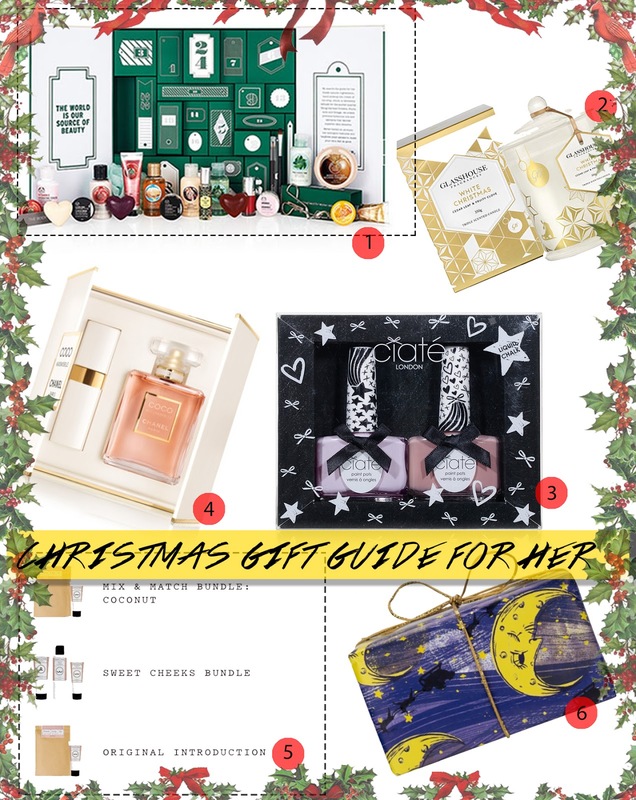 Read on for gift inspo for HER! I don’t know about you guys but I’ve never owned an advent calendar. Nor have I really known what a beauty advent calendar was up until just recently. Reading through Zoella’s advent calendar post, I was mesmerised that such things exist for beauty products. An advent calendar is just a mini countdown till Christmas calendar. It features 24 days of mini shelves and slots which you open each day from December first up until christmas and you receive mini sample (even deluxe for some) gifts each day, each slot. It’s a fab idea and could be your ‘pre christmas’ gift for her! Now I’m a massive candle fan. I love scented candles a lot and there’s no such thing as ‘too much’ christmassy scent around christmas! This cute candle smells like christmas in a jar. Literally. It’ll be like you’re in Santa’s Village about to snack on Mrs Clause’s cookies and cakes. This is a cute gift for a candle lover! Ciate literally has the cutest packaging for nail polishes. All their gift set colours are fab too and a girl can never have too many nail polishes, right?! Go on and pop this one into the basket for her! I’ve raved about how much I love Chanel Coco Mademoiselle perfume HERE. From the moment you smell Coco Mademoiselle, I’m telling ya, you won’t want to put it down! It’s just a beautiful, sophisticated scent which ANYONE – and I mean anyone – will love. Guaranteed. And plus, the packaging is super cute so it’ll look fab sitting on a desk – bonus! If you don’t know what to get her but you do know that she’s a scrub and pamper fanatic, you can make your own bundle at FRANK! Pick and choose different types of scrubs, balms and moisturisers and a few clicks and ‘ahhs’, ‘ooohs’ and even ‘I want this for myself!’ later, you will have a cute personalised bundle ready to go! Lush has always been my favourite. I just adore the store in general. I love walking in and getting hit with sweet scents and seeing all the glittery and sparkly goodies stocked on shelves and tables. In a nutshell, I love lush. If she’s a bath person, she will adore this gift! It comes in a cute packaging with two bath bombs that will take her on an intergalactic journey to the North Pole! Well…not really, but throw in a Christmas movie and you’re halfway there! What are some of the things on your wish list?